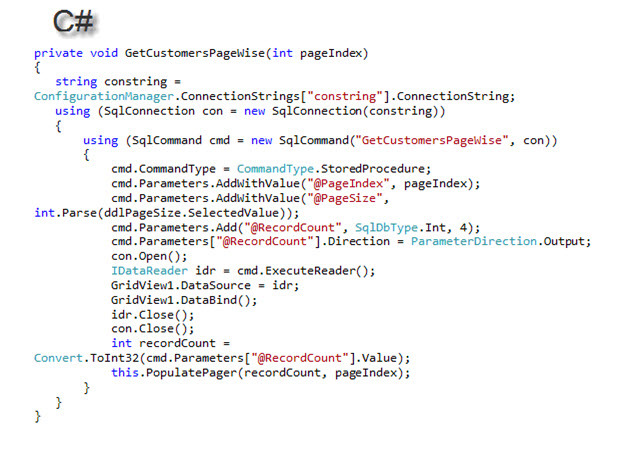 In this article I’ll describe how to implement Custom Paging in ASP.Net GridView control. ASP.Net GridView fetches all the records and then displays one page from the fetched records. Thus for illustration if your table has 1000 records and you want to display only 50 records per page, GridView will fetch all 1000 records throw away the 950 records and display the 50 records based on the page index selected by the users. 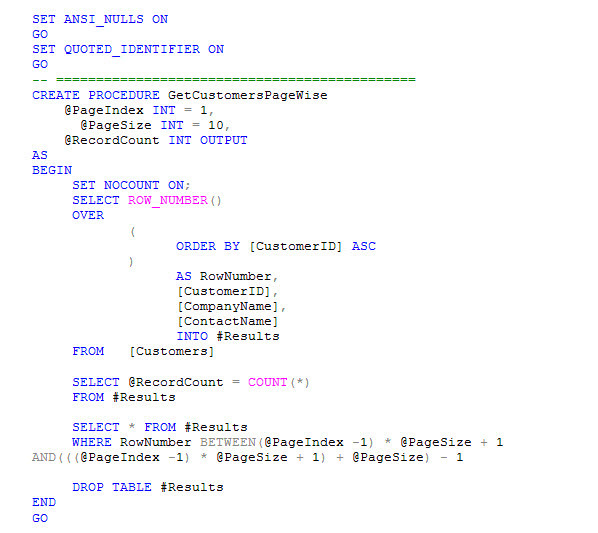 SQL Server 2005 came up with the new ROW_NUMBER() keyword that allows us to give row numbers to the records that we select from the table. 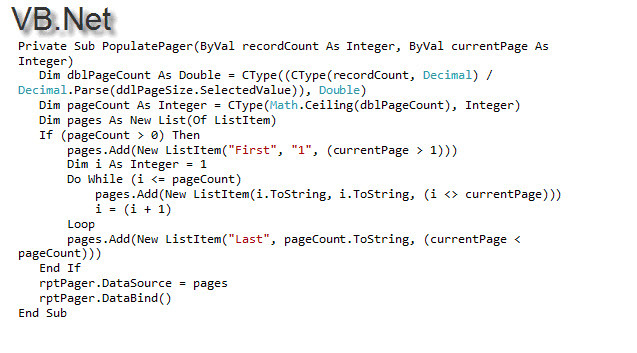 Using this row number we can apply our custom pagination logic within the SQL Server Stored Procedure. 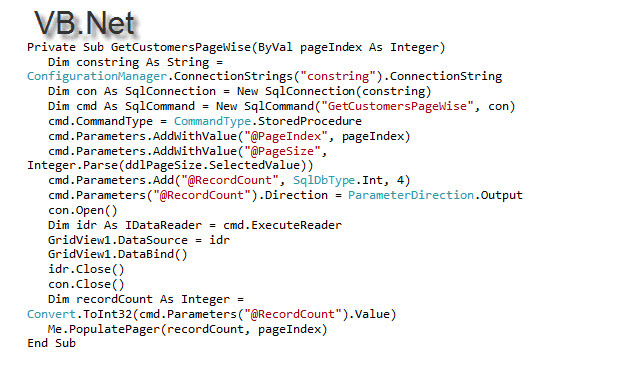 I am using the Customers table Microsoft’s NorthWind Database for this article and below is the Stored Procedure that allows us to fetch records page wise. Above I am passing the PageIndex, PageSize as input parameters so that we can get the records for the preferred page index. And for populating the Pager in front end we will need the total number of records in the table which we are fetching using the RecordCount parameter. The HTML markup is quite simple it has a GridView, a DropDownLists selecting the Page Size and a Repeater which will be used for populating the pager. Below is the event that is raised when the Page Size DropDownList is changed. 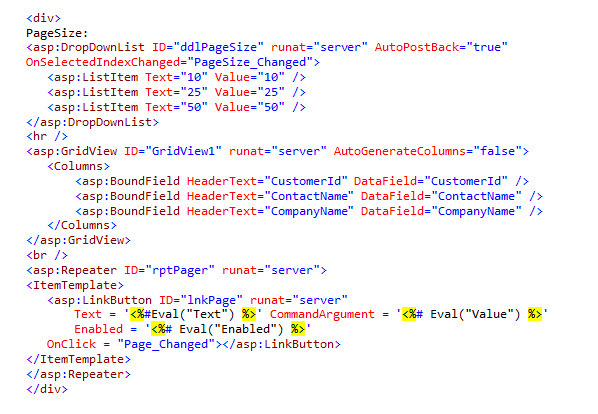 This method simply calls the GetCustomersPageWise() method. But what will be happen if i have 100000 or more pages????? It doesn’t make much difference even if you have 100,000 records. 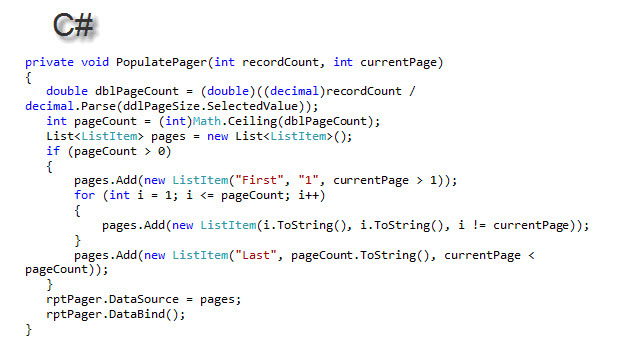 You just need to have most optimised select statement and much optimised table structure to return fast result. i want to implement this paging for it. plz help me how can i do this???? You were able to very clearly illustrate each stage of work in order to get the necessary result and continue to move on.